Our back-row seats provided an aerial view of the rink and an up-close glimpse of the rafters. As soon as we mounted the steps, our oldest daughter slumped into her seat and shut her eyes, her way of overcoming height-induced vertigo. Moments before the show began, an event staff member climbed the steps and approached us. "We have a few open seats in the front if you'd like to move closer," he said as he gestured below toward the front rows directly behind the announcers and the television cameras. Of course, in my mind this invitation to upgrade was a direct result of my family's extraordinarily photogenic qualities, even though my kids were now horizontally sprawled out on the bleacher seats to prevent themselves from falling forward and I was rocking a long sleeve tee shirt and one of those last minute, up-do knots where you don't pull your hair entirely through that final loop and end up with a noncommittal cross between an actual ponytail and an unfinished bun. Just to make sure we're all on the same page, this invitation had nothing to do with the fact that the event planners had been asked to strategically pack the crowd for television. No, clearly, they saw star quality in us, and we cashed in on it. Carpe diem! Seize the upgraded seats! All that being said, if I had any foresight, I would have posted about this adventure earlier and you could have watched the show to catch brief glimpses of my family in the crowd, an activity that kept my daughters seriously entertained this afternoon, like some epic, moving game of Where's Waldo, minus the stripes and glasses. 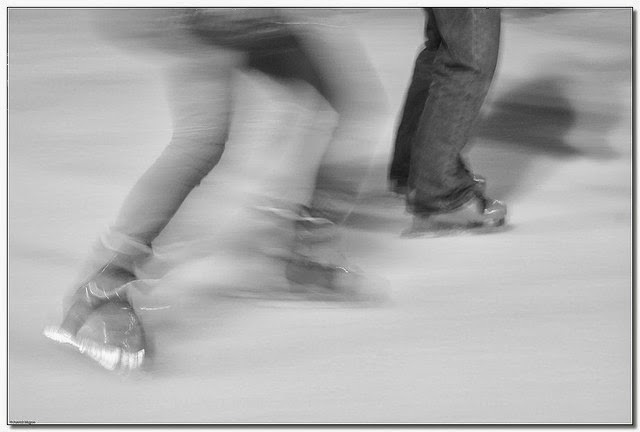 Because, really, who needs to focus on a skater's triple salchow or impressive backflips when you might catch a fraction of a second's worth of your own blurry silhouette in the background? Or, as my daughter grandly announced to dinner guests who arrived during the final minutes of the program, "We're in this show, you know." Yep. We're there, all right. Front and center. Sweet! That would have been so awesome! I would love to go see a live figure skating show! I think my oldest daughter would dig it too!